Baduci is a form of draw poker which is still relatively unknown but which is becoming more popular as players look for some variation on the standard themes. Reading our guide to the similar game Badugi will give you a good grounding to the basics of this game but there’s more to learn here because Baduci adds elements of 2-7 Triple Draw. Make sure you know what you’re doing before wagering any money on this fairly interact game. The aim is to create the best four card hand according to Baduci rankings and the best five card hand according to Triple Draw hand rankings. The first draw now takes place and players can opt to discard and replace up to three cards to improve their hand. Two more betting rounds and draws take place and then one final betting round after which the showdown tales place, assuming that there is more than one player remaining in the game. 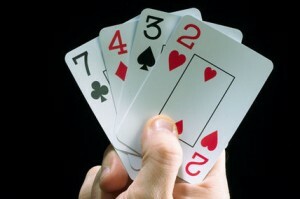 The pot is split into two parts – half for the player with the best Badugi hand and half for the best Triple Draw hand. The best Badugi hand is a four card hand with the lowest possible cards (including A) of different suits. The best Triple Draw hand is the five lowest cards which are not a straight and not a flush. Aces are high and it’s the A which produces the difference in the rankings between the Badugi and Triple Draw – A is low and valuable in Badugi. The difficult task of winning both halves of the pot is called ‘scooping’. Read more about Badugi and Triple Draw hand rankings here.